① Add the minced shio lemon and white sesame seeds to the cooked rice and mix in well. Divide the rice into two portions – one that is 1/3 of the total and the other, 2/3 of the total. ② To the 1/3-portion of rice, add the salmon flakes and mix them in with a cutting motion. Divide this rice into five equal portions. 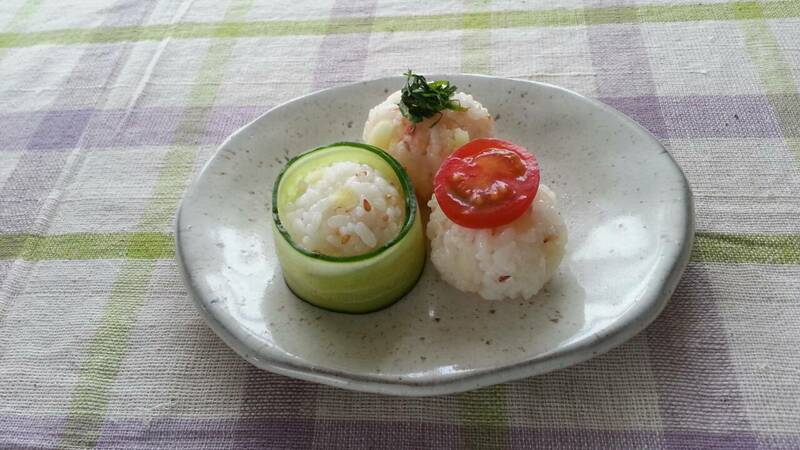 Place each on a piece of plastic wrap large enough to enclose the rice, and then form each portion of rice into a ball. Remove the wrap. Julienne the green shiso and use it to garnish the rice balls. ③ Divide the 2/3-portion of rice into 10 equal portions. Form these into balls as described above. Remove the wrap. Take 5 of the balls and wrap each with a slice of cucumber. Place a slice of tomato on top of each of the remaining 5 balls.